I was hit by a car last month. I was crossing an intersection on foot (in a crosswalk, at a green light), and was struck by a vehicle making a left turn across my lane of traffic. 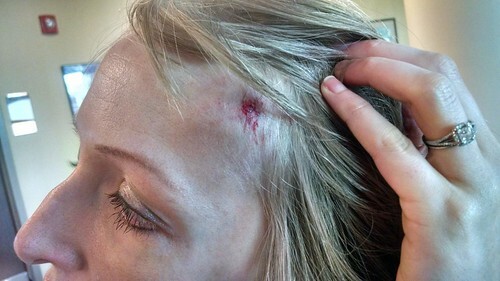 I experienced a number of bumps and bruises, but the worst injury was to the left side of my head (the impact knocked me to the ground and I hit my head on the asphalt). It’s been over four weeks since the accident and I still have a lump on my head underneath my bangs. 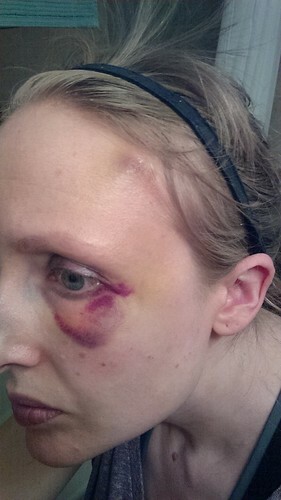 Most noticeably, the trauma of the head injury caused a black eye, which is much better but not completely gone. The experience was quite disconcerting, and even though I wasn’t in the wrong, I’ve been a bit over-careful while crossing the street since then (for instance, waiting for drivers to fully stop and acknowledge my existence before I proceed). A new activity in my life that makes me happy is cycling. I bought a bike in 2008 when I lived in Alexandria, VA and rode regularly for a while, but the habit died off when I moved into DC in 2010 and then to Buffalo in 2013. I told Paul he needed to get a bike so we could ride together, so we picked up a used Cannondale for him at a local bicycle shop. He embraced the cycling habit right away and we’ve been on our bikes most Saturdays and Sundays for the past few months. Paul is great with maps and navigating, so he plans our routes for us in advance. We’ve explored a bunch of trails already and it’s been a really fun way to experience the area (we travel much slower than a car, but a lot faster than we would on foot). Currently Watching: Mostly documentaries, like Lisa Ling’s This is Life, GasLand, and Chasing Ice. I Love the Victorian Era. So I Decided to Live In It. This is amazing! How had I never heard about this woman, or her books, before last week? I don’t want to take her lead and live in a recreated Victorian era, but I love that she and her husband enjoy it so much and go to such efforts for authenticity. (They use a period-appropriate icebox instead of an electric refrigerator, which they stock with block ice and empty melted water from the drip tray 1-2 times a day. There’s a wind-up mechanical clock in their parlor, and she writes in her diary using an antique fountain pen that she fills with liquid ink using an eyedropper.) She’s written two memoirs, both of which my library owns, so expect to see them pop up soon in my monthly reading roundup. Quitting Your Job To Travel Isn’t Brave. It’s Lucky. This post is spot-on. I get annoyed with travel writers who proclaim that everyone can do what they do. No, everybody cannot — or should not — do what you do. Even if you’re single and childless, it’s irresponsible to quit your job to travel if you have debts to pay off. Fulfill your obligations first. And when you’re debt free and everything is lined up for your departure, don’t forget you’re lucky to be taking advantage of this opportunity. Unless you’re traveling to a war zone or something similar, traveling is not brave. When It’s Time to Detach Yourself From Your Things. Do you have a collection, or something else you’re particularly attached to? J. Money discusses his coin collection, but his thoughts can be applied to pretty much anything. Hoarding is a Serious Disorder and It’s Only Getting Worse in the United States. This reminds me of the book on hoarding I read a few months ago. Six years ago: A Farewell of Sorts. After writing weekly posts for BlogHer for three years, I decided to quit. Here’s why. Seven years ago: Marriage? I Could Take It or Leave It. This was written a year before I met Paul. Eight years ago: Nobody Asked Me If I Was Okay. The day I almost passed out on the Metro. I’m so glad you are ok! So scary. That looks painful. Glad you are okay. Biking is a great way to get out and enjoy the outdoors. I love biking on the WOODS Trail back here in NOVA. That should be W&OD Trail. Stupid autocorrect.